Maui'd Forever is offering a travel special to Hawaii for their destination wedding couples. This special is for the Royal Kona Resort. They are happy to announce a travel package special from Pleasant Holidays. This new package must be purchased by April 28, 2013. From time to time Maui’d Forever can offer tremendous savings with their travel specials. 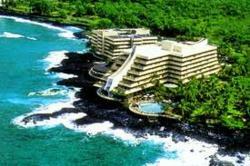 The special being offered now is a vacation package with accommodations at the Royal Kona Resort. We have 3 nights with air from $639 with Kids 17 and younger staying for free.